It seems that I tend to eat (or feed) steak quite often these days. Can’t deny that I currently live in a beef loving country. I had some leftover beef lomo cut (beef tenderloin) and decide to use it up on a Korean flavored meal. By the way, I love the sound of the Spanish word “lomo”. I am one of the lomo lovers. Anyway, I am not sure if I can call this a recipe, but you might like what I did. My kids and I devoured the entire skillet of this lovely bibimbap within 5 minutes. Let’s make the sauce to top up the bibimbap. 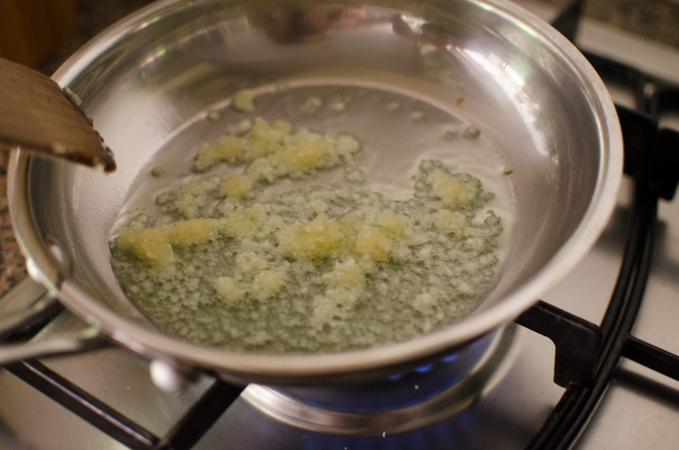 Fry some minced garlic in oil. Add gochujang (Korean chili paste) and other sauce ingredients. Bring it to boil and simmer for 2-3 minutes or until the sauce thickens. The sauce is done. You can use this sauce for any type of Korean bibimbap. So good! Cook steak according to your taste. I only seasoned mine with salt and pepper, and cooked it to medium. 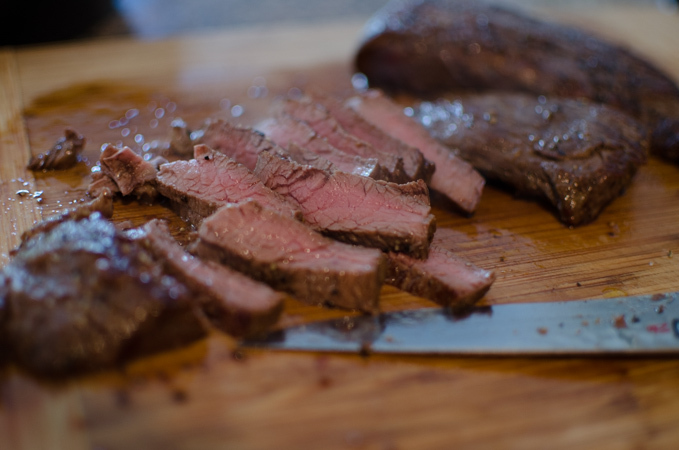 You can use other cuts of tender beef, such as ribeye or striploin. Just make sure to not to overcook them. Oh, and if you don’t like the long strands of spinach, chop it up! Simple! Cut the beef against grain into thin slices. 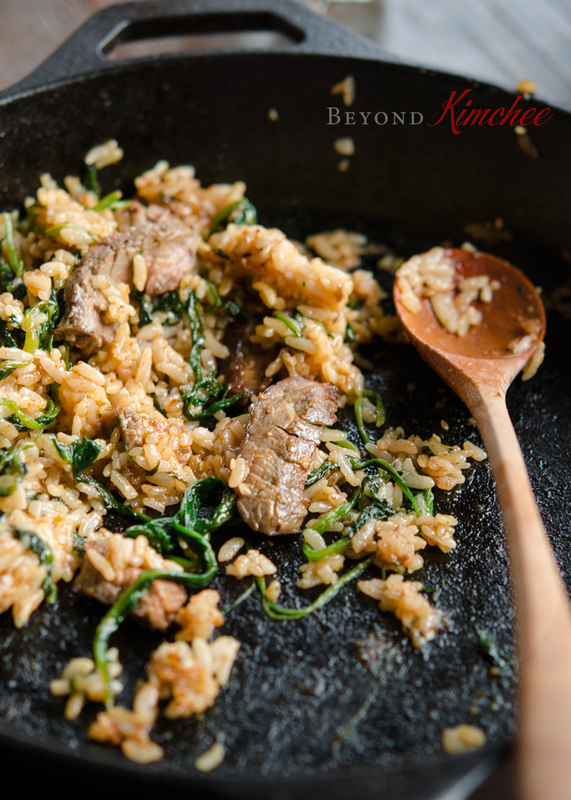 Place some rice, beef, and spinach on a heated skillet over medium heat. 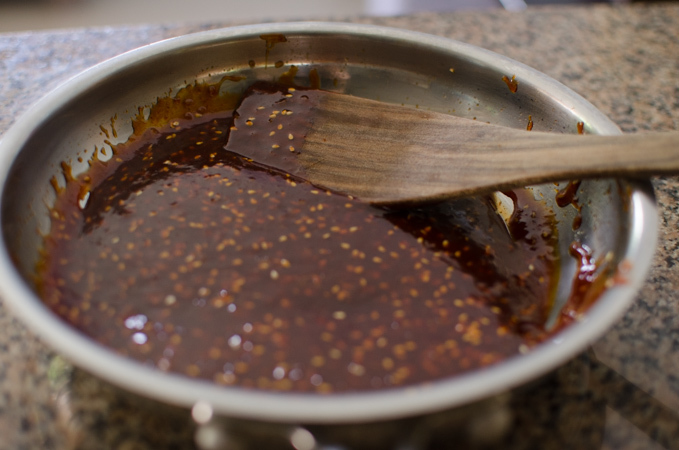 Drizzle the sauce – however much you desire – and start mixing altogether until everything mingles and is coated with sauce. It should take about 1-2 minute. You will hear the delicious sizzling sound coming out from the skillet. Done! Sprinkle some toasted sesame seeds to add nuttiness and to drive you nuts for all the great flavor! Dig in while it’s sizzling hot! You’ve gotta love it! My kids and I didn’t even use individual rice bowls. We just ate out of skillet all together. That’s the Korean way of family bonding. We love each other so much that we don’t mind our spoons touching. 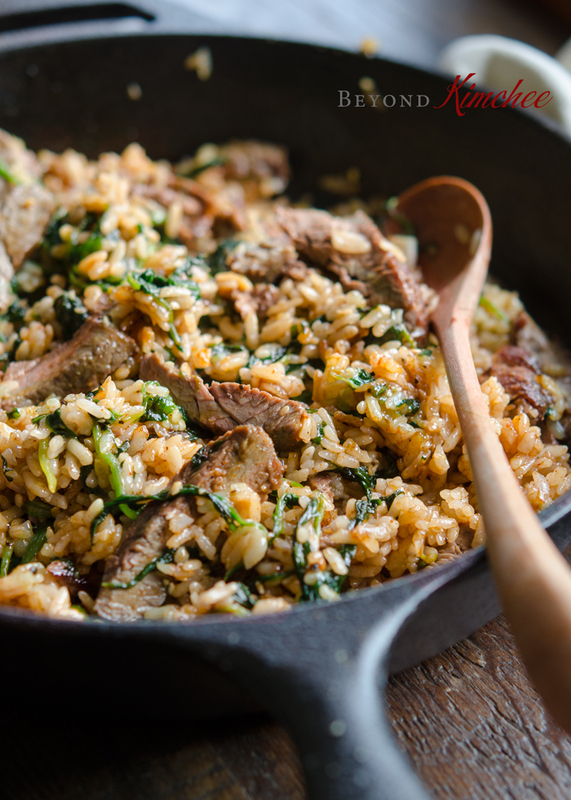 This is one of the simplest way of making bibimbap in a heated skillet. If you don’t like spinach? Use whatever vegetable you like. Anything will taste great! 1 bunch spinach, cleaned and roughly chopped if desired. 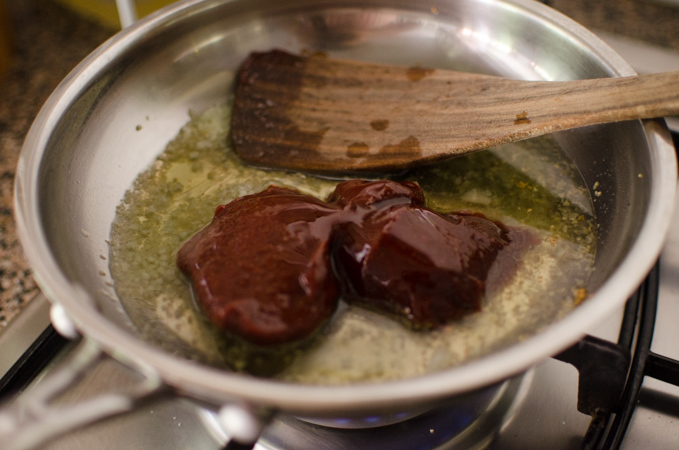 To make the sauce; heat 1 tablespoon of oil in a small skillet and saute the garlic until fragrant. add the rest of the ingredients and mix well. Bring to a full boil over medium heat and let it thicken a little. Remove from the heat and set aside. The sauce will thicken more as it cools. 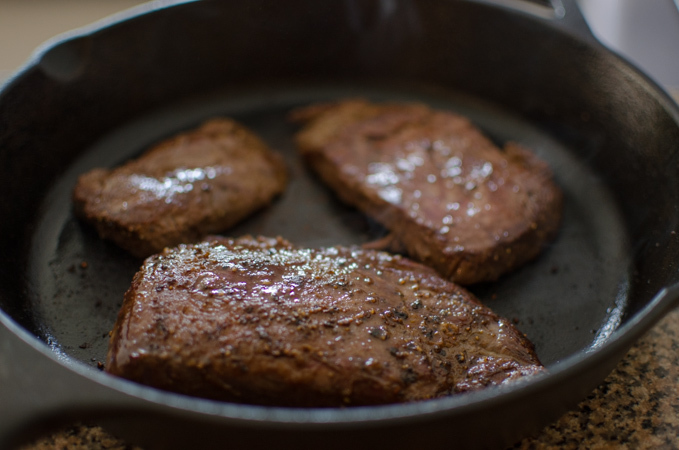 Season the steak with salt and pepper and cook to medium or desired doneness. Remove from the skillet and set aside to rest. 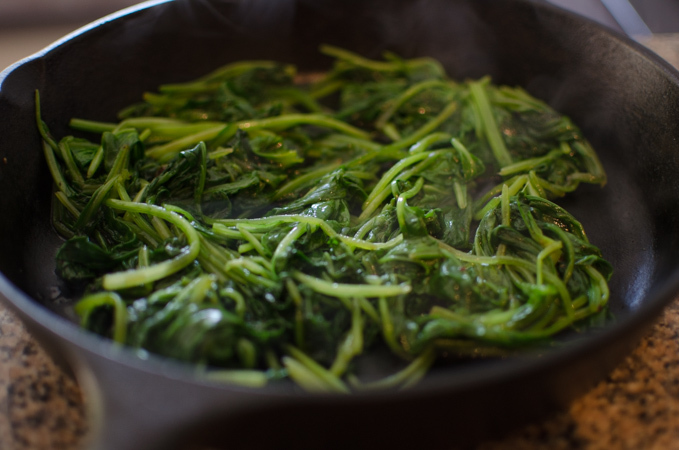 Saute the spinach with a little bit of salt in the same skillet until wilted and soft. Remove from skillet and set aside. Cut the steak into thin strips. 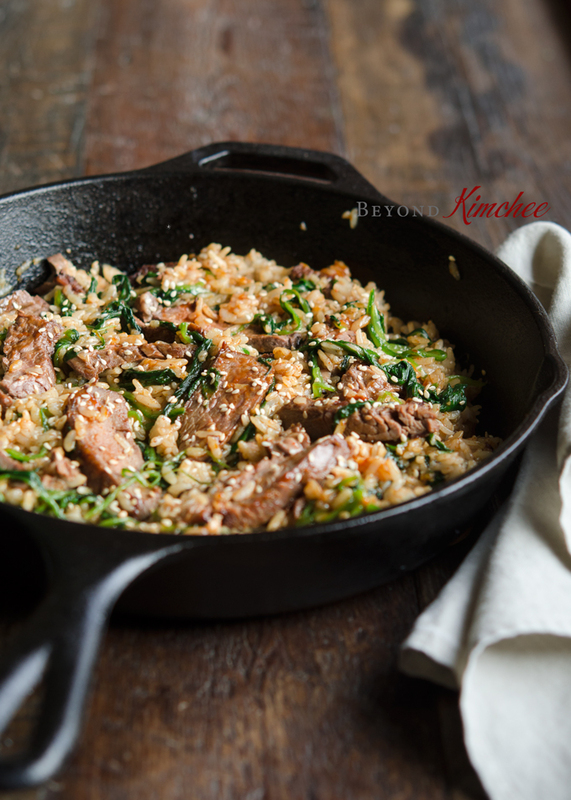 Bring the skillet over medium heat again, spread rice, and top with beef slices and the spinach. Drizzle the sauce, about 3-4 tablespoon, let the whole thing sizzle and start tossing together to coat everything with the sauce. Taste and add more sauce if needed. Once everything is all mixed, remove the skillet from heat. Drizzle a little more sesame oil and sesame seeds as you desire. Serve immediately. So simple! I love bibimbap but to prepare all the traditional ingredients is so time consuming. 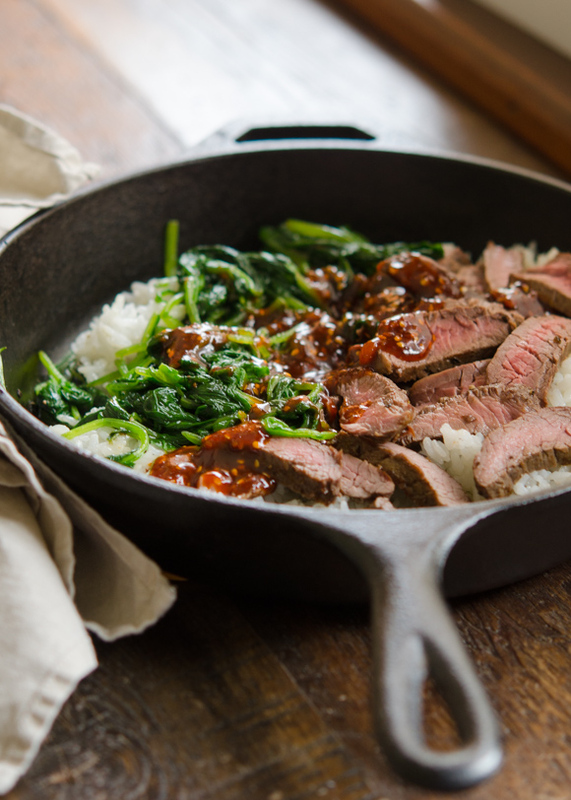 Your steak and spinach version seems easy breezy and yummy :-) Thanks for the idea Holly! I know, the traditional bibimbap is great but takes so much time and effort to make. I enjoy making simplified version of using 1-2 ingredients in bibimbap and enjoy the same goodness that bibimbap delivers. Wonder full, Sherry! So happy to hear that your family loved it. I am seriously in love with this dish. I make it on a regular basis. I cannot thank you enough. 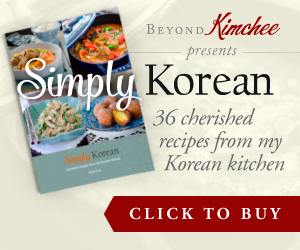 I also bought your cookbook and love love love it. Your recipes make me happy. 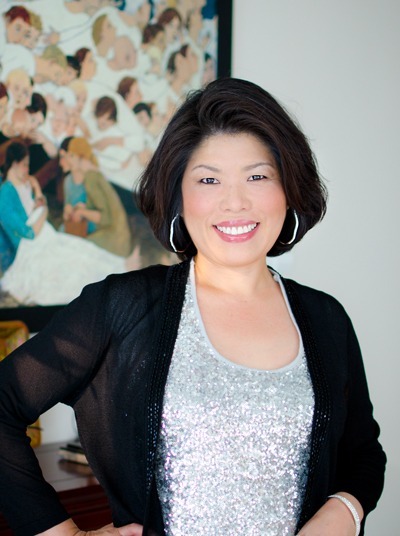 Thanks, Kim. It makes me happy to hear that, too. HI, I find your site very interesting, I love Korean dishes so much, about the bibimbap sauce, can I use other oil if the grape seed oil is not available? Sure, any oil can be used.